The Melbourne Toilet and Basin Suite has a contemporary, stylish design they'll enhance the appearance of any modern bathroom. 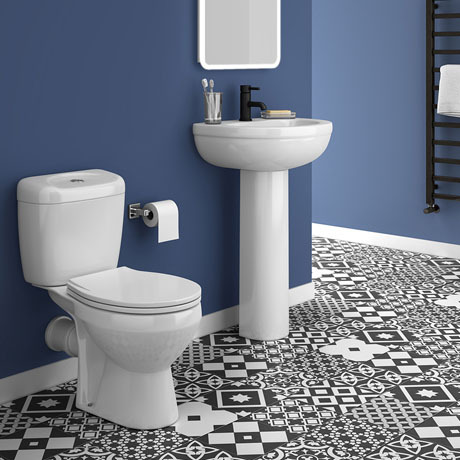 Comprising of a ceramic toilet and basin, the Melbourne suite offers true value for money, and the chance of a stylish bathroom at a great price. The Melbourne toilet has a chrome push button design, and the basin is a 1 tap hole option. Didn't expect this suite to be as good as the one in homebase, over half the price and amazing quality. Very happy with my new cloakroom suite. i am really delighted with this toilet and basin combo. It was a good buy and great value for money. Superior quality and a fashionable design.Fits in and looks perfect for my bathroom.